Apple's fleet of self-driving vehicles roaming the streets of California is now at 62 vehicles and 87 drivers, up from 55 vehicles and 83 drivers just two weeks ago. The numbers come from ongoing coverage provided by macReports, citing information obtained from the California Department of Motor Vehicles. Apple has been expanding its autonomous vehicle test since it was granted a permit from the California DMV in April 2017, enabling it to test the advanced technology on public roads in the state. 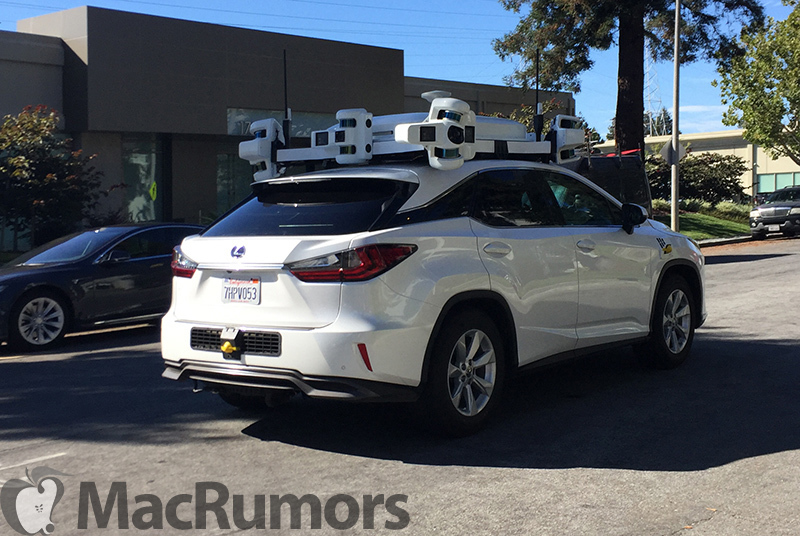 Beginning in early 2018, multiple sources reported on the number of vehicles in Apple's fleet, with 27 autonomous vehicles counted in January and 45 in March. Each of Apple's cars is equipped with the company's in-development autonomous driving software, along with advanced LIDAR equipment and an array of cameras to detect the vehicle's surroundings. The actual cars are Lexus RX450h sports utility vehicles and must have safety drivers inside of them, since Apple's permit does not include driverless testing. Apple's growing collection of self-driving vehicles is reportedly gathering data for the company's long-rumored autonomous vehicle software. Apple initially pivoted to self-driving car software when plans for its own electric vehicle fell through. As Apple continues to grow the fleet, it's still unclear exactly what the company will do with the software when it's finished the testing phase. One likely possibility will be a partnership between Apple and an existing car manufacturer to place the self-driving software inside a vehicle not built by Apple, which could be implemented through a future version of CarPlay. Rumors that date back to 2016 suggest the software could include augmented reality aspects, like a heads-up display that provides a collection of useful driving details from various apps. Since those rumors, AR has become a huge field of interest for Apple with the launch of the iPhone X and ARKit, so it's easy to see Apple's interest in potentially expanding such technology into driving. More recently, in June 2017 Apple CEO Tim Cook confirmed Apple's work on autonomous software: "We're focusing on autonomous systems. It's a core technology that we view as very important. We sort of see it as the mother of all AI projects... it's probably one of the most difficult AI projects to actually work on." Let’s use all these technologies to make EXISTING cars safer and eventually only after it proves that it can drive itself safely, then make self driving cars. In the mean time slow down. My Tesla drove me to Toronto from Boston this weekend. One area where it definitely is far better at handling than me is construction zones - I came to an area where I couldn’t make heads or tails of what lines were supposed to be followed vs which had been “erased” but the car knew exactly which lanes to follow. It handled ~97% of the 1250 mile drive. It steadily ticks upwards with free monthly over the air software updates. I look forward to the day that it’s better than me at every task and I no longer need to give it any input beyond what the destination is.